You can apply a Process to any audio that has been loaded into Revoice Pro. The APT process needs two signals (a Guide and a Dub) to operate, whereas Doubler and Warp just need one. The precise steps are set out in the individual Process sections of this manual, but this chapter is a basic introduction. If you do not see the New Process window (shown in the image at right), then you need to open it. There are two ways to do this. 1) RIGHT CLICK in any Process Control Track and select New APT/Doubler/Volume/Warp/Analyser . 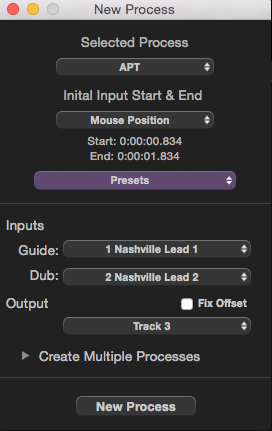 2) Make sure the Revoice Pro session window is selected and press the B key on your keyboard. This will open the New Process window as shown. Pressing the B key again will close it - but it is generally more efficient to leave this window open. In this window you can select which audio will act as the Input(s) and set the track(s) to which the processed Output(s) will go. Revoice Pro automatically preselects all of the drop down menu items in the New Process window, based on previous settings or its best guess as to the most relevant settings. You should always check its selections and change them as required. You can also decide whether or not multiple processes are created (see Related topics below). You can also change the Process in this window by selecting it from the drop-down menu at the top. Pressing New Process at the bottom (or pressing N key) will run the Process concerned with the parameters selected.